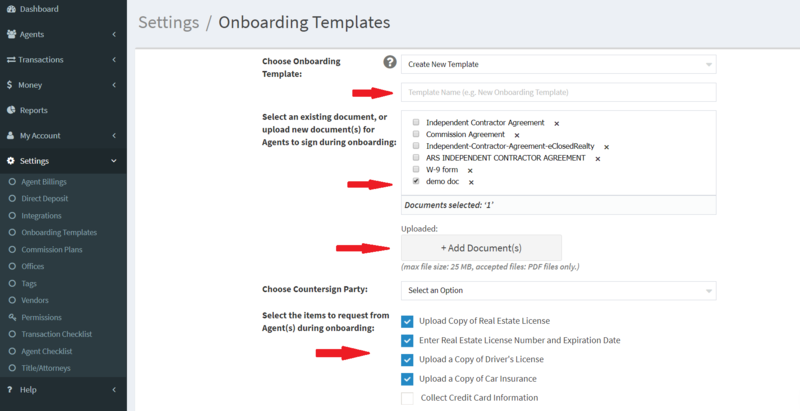 You have the ability to create on-boarding templates prior to sending them the agents. To create a template go to settings> on-boarding templates. Once you create a template you can not go back and edit it, you can create a new one to add additional documents. Click continue and a new browser tab will open allowing you to markup or edit your Docusign template. Click Save and Close and you're template will be created. To see how to complete the on-boarding process and how to mark up your documents please visit the link below for instructions. Go to settings> On-boarding template> Choose the template you would like to delete> hit delete button. In the docusign markup screen, after you verify all the fields have been marked you will need to hit Save and Close- if you do not hit save and close your documents will not save.